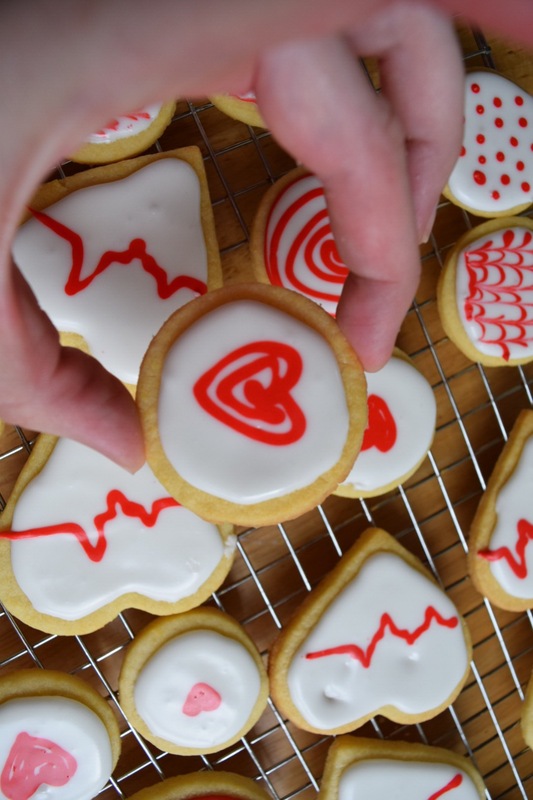 EKG Heart Cookies with Royal Icing!﻿ – Abbey Co. I have been really motivated to get more creative with my icing techniques lately. There are tons of viral videos of people doing beautiful things with Royal Icing, or making these garden looking cakes with buttercream… I need to up my game. Well, I just happened to have quite a few family members graduating, one being my sister-in-law from nursing school with her RN! What a perfect opportunity to shower someone with sweets. 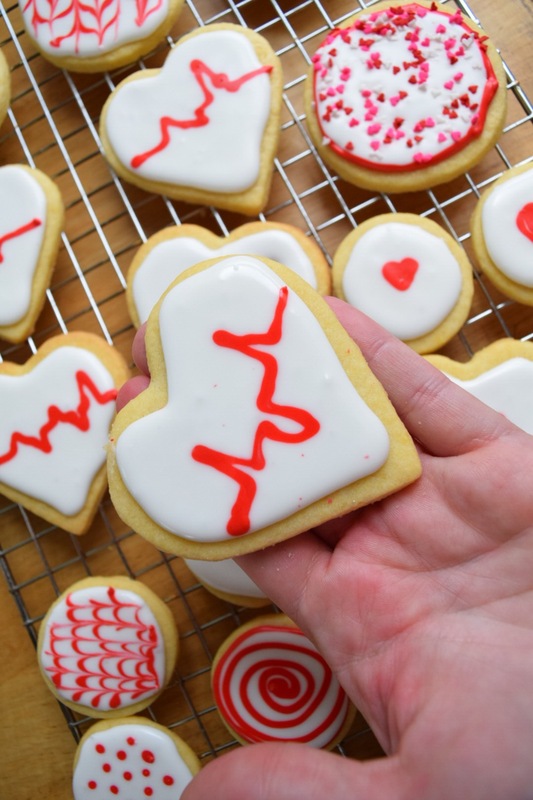 I set out to scour Pinterest to find the perfect recipe to attempt, and found this adorable inspiration from Heidi’s Sweet Shoppe, she has these adorable “EKG Cookies” for sale that look like they were made with Royal Icing, and I thought they would be perfect to try to make! Well, here is my version! I made the white Royal Icing very wet, which allowed me to in-lay the red into the white. 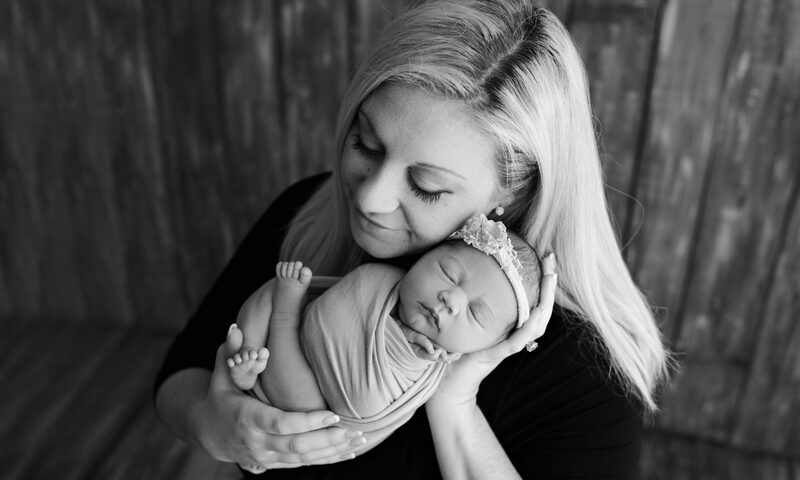 Here is how they turned out…. what do you think!? I used a very simple cookie recipe that I actually whipped up in my food processor… how easy does that sound? Then, I used my Wilton Meringue Powder and recipe from yesterday’s post to whip up this very simple Royal Icing! I used at least 7-8 Tablespoons of water to make the icing come out very runny… I piped it on then used a toothpick to even out the surface and fill in the gaps. You can see some of my cookies had a few dimples, but in all I was very happy with how they turned out for one of my first real tries with Royal Icing. Okay so recipe share time! Place the flour, sugar and butter in your food processor fitted with a steel blade. Pulse 4-5 times initially, then process for 10 seconds to make a mixture the consistency of corn meal. Toss in your egg yolks and vanilla. Copy the same process of pulsing then processing for a few seconds. Scoop out the dough and form into a 6-inch disk. Cover in saran wrap and chill for at least 1 hour before baking. Dough can be refrigerated for several days before baking if desired. When ready to bake, preheat your oven to 350 degrees Fahrenheit and lightly butter your cookie sheets. Using 1/4 of the dough at a time, roll it out on a lightly floured surface until about 1 CM thick. Cut the cookies out with your desired cookie cutter and transfer to your cookie sheet. Bake for 10-12 minutes, or until the edges are just slightly golden. Let the cookies rest for two minutes before transferring to a wire rack. Allow the cookies to cool completely before attempting icing them. 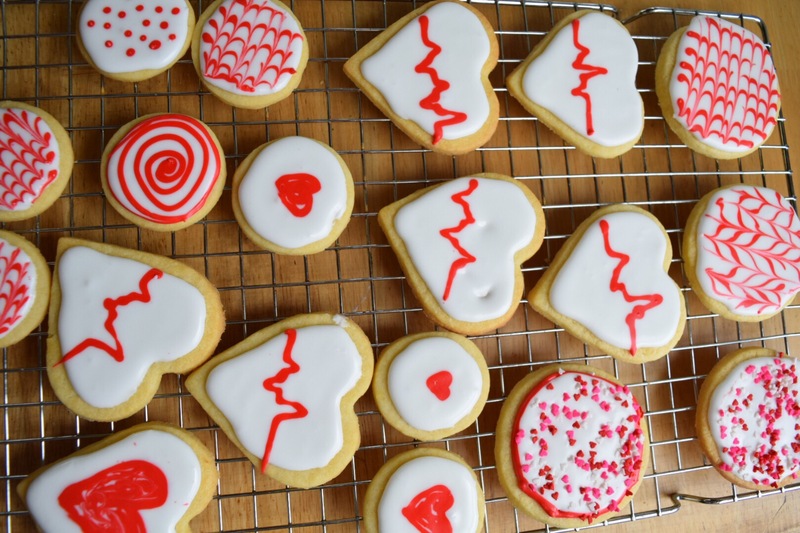 For the icing, follow directions from yesterday’s simple Royal Icing post. In case you are wondering what kitchen accessories I used, here are some of the tools that were put to work to make this possible! Awe these look adorable! ❤ and yummy!! Awww love the red decorations 😛 looks delicious! Love these! I’ve totally been into royal iced cookies at the moment, and these look great! The wilton colour right system is awesome! They look so cute and tasty! Oh my, those cookies are adorable! Great Job! Pingback: June Recap! – Abbey Co.
Pingback: 12 Days of Christmas Blog Challenge Day 3 – Favorite Christmas Cookie (Sugar Sparkle Cut-Out Cookies (for Santa) – Abbey Co. Previous PostPrevious What is “Royal Icing” Anyways?